Uncanny. Wisconsin negates the penalty before it even gets started. Frederic called for interference. Common theme all year. Wisconsin now goes for interference and we will skate 4-on-4 that will go as a successful PK for Penn State!! Three seconds later, UW's Frederic is called for interference on the faceoff, so we're at 4-on-4. Both teams are back to full strength. Scoreless with 8:30 to go in the first. McGuire had a chance in front, but Jones with a nice denial. Penn State scores on a 2-on-1 to make it 1-0 with 6:27 left in the period. Odd man rush and a goal for the Nittany Lions. Nate Sucese puts it home. NITTANY LIONS GOAL: Nate Sucese finishes off a 2-on-1 pass from Goodwin, and it's 1-0 PSU over UW with 6:27 left in the first. Started with a bad play in the offensive zone by Tischke, who overskated the puck and left McGuire all alone at the blue line. Penalty on PSU will give UW another power play with 4:46 to play in the opening frame. PSU's Gober gets an interference call with 4:46 left in the first. UW goes to the power play, trailing 1-0. Another power play for UW. Gober goes on timeout for interference. Frederic had a good chance in front of a pass in the center of the ice, but he couldn't get wood on it. 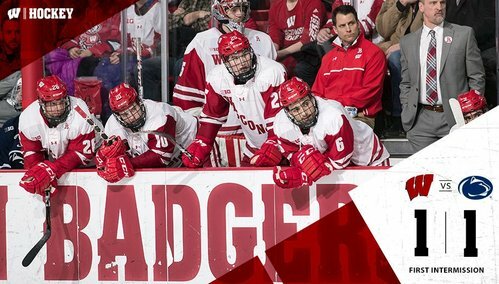 Power play expires with nothing to show for the Badgers. Penn State still leads 1-0 with 2:30 to go. Bucky heads right back to the power play as PSU is called for cross-checking. A couple good opportunities for UW, but no scores. They go back on the power play immediately though. PSU kills the penalty, but Thompson gets called for cross-checking UW's Wagner. Badgers back on the power play with 2:28 left in the first. Power play comes up empty handed again. 30 seconds left. Matt Ustaski puts one home just as the PP expired. 1-1 game. BADGERS GOAL: Matt Ustaski ties it 1-1 with 22.5 seconds left. First try blocked, Besse fed him again for the putaway. Besse with an excellent pass from behind the net to a wide open Ustaski in front. Goal was a long-time coming after several chances. END 1: Wisconsin and Penn State are tied 1-1. Sucese for PSU, Ustaski for UW. Shots are 11-10 for PSU. After 1 in Columbus: Ohio State leads Minnesota 1-0. Ah yes, America's favorite intermission game: People in bubble suits trying to play hockey with their feet. Will anybody score tonight? We have a bubble hockey goal sports fans! Oh and another. What an effort by the boys in white tonight. Teams are back out for the second period, tied 1-1. PSU up on shots 11-10. Second period has started at the Kohl Center. Badgers and Penn State are tied 1-1. If you were unable to come to the games this weekend, here is the Jeff Sauer tribute video aired at intermission.